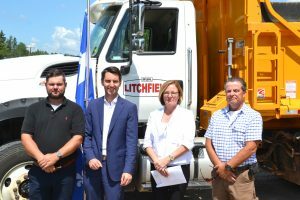 Local officials met in Litchfield on July 31 to announce over $350,000 in funding for the relocation of the intersection of chemin Laforet and Hwy. 148. From left: Litchfield councillor John Stitt, Transport Minister and Pontiac MNA André Fortin, Mayor Colleen Larivière and councillor Donald Graveline. The dicey intersection at chemin Laforet and Hwy. 148 in Litchfield will soon be a thing of the past. Mayor Colleen Larivière said she was pleased that the project is nearly complete, as it was one of her priorities when she was elected five years ago. On July 31, local officials were at the town hall in Litchfield to announce funding for the relocation of a perilous intersection along Hwy. 148. 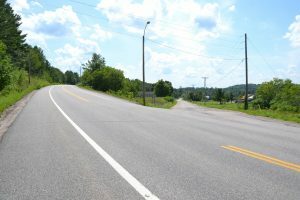 Pontiac MNA and provincial transport minister André Fortin, alongside Litchfield Mayor Colleen Larivière, announced $353,415 in financial assistance to move the intersection of chemin Laforet and Hwy. 148. 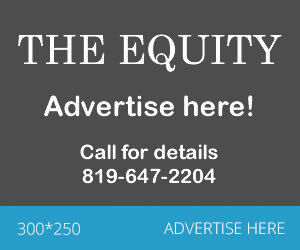 The funding represents roughly 75 per cent of the project, with a further $117,804 being allocated from the Municipality’s gas tax. “It’s always fun, as transport minister, to announce projects in your own riding because first and foremost, you do it for the people here locally,” Fortin said. For those not familiar with the intersection, it sits at the bottom of the hill just north of Campbell’s Bay. Vehicles attempting to turn onto the westbound lane towards Fort Coulonge have very limited visibility of vehicles coming down the hill.